Armenian King Tigranes the Great had served as a source of inspiration not only for the local historians and artists but also for European cultural luminaries. Being the hero of more than 20 operas, the King occupied a specific place in European music culture. PAN will tell about these operas and their authors. It’s not accidental that European composers dedicated to Mithridate 17 operas, where Tigranes was among the main heroes. One of these operas was created by Amadeus Mozart at the age of 15. As to operas composed to honor Tigranes, their number, according to common opinion, reaches 24. Some experts believe they are about 32, although the authors of several of them are not known, or these were pasticcio operas created of works by different composers. Besides, Tigranes the Great is not the main hero of all these operas. Sometimes, characters named Tigran(es) were Armenian princes or commanders in operas mostly composed by baroque and classicism representatives. The authors of the operas directly or indirectly referring to Tigranes the Great are mostly Italian. They are: Tomaso Albinoni (Tigrane rè d'Armenia,1697), Antonio Bononcini (Tigrane, re d'Armenia, 1710), Pietro Bernardoni (Tigrane, re d'Armenia, 1710), Alessandro Scarlatti (Tigrane, 1715), Francesco Gasparini (Tigrane re d'Armenia, 1719, with Antonio Vivaldi, Francesco Conti and Giuseppe Orlandini), Antonio Vivaldi (Tigrane, 1724), Geminiano Giacomelli (Tigrane, 1733), Giuseppe Paganelli (Tigrane, 1733), Santo Lapis (Tigrane, 1739), Giuseppe Arena (Tigrane, 1741), Daniel Dal Barba (Tigrane, 1744), Antonio Palella (Tigrane, 1745), Giovanni Lampugnani, (Tigrane, 1747), Giuseppe Carcano (Tigrane, 1750), Ignazio Celoniati (Tigrane ,1757), Niccolò Piccinni (Tigrane, 1761), Antonio Tozzi (Tigrane, 1762), Giuseppe Colla (Tigrane, 1767), Pietro Alessandro Guglielmi (Tigrane, 1767), Vincenzo Righini (Tigrane, 1795). Tigranes the Great was also featured by Italian composer Giuseppe Sarti in the opera titled Pompeo in Armenia. Recording of the Hungaroton label (2004), extract from Vivaldi’s II Tigrane opera staged in Budapest. The great Armenian king was also the hero of the works by German composers Johann Adolph Hasse (Tigrane, 1729) and Christoph Gluck (Tigrane, 1743). Renowned German, later British baroque composer George Handel refers to the historical events taking place in the 1st century AD in an opera titled Radamisto, where Tigrane, Prince of Pontus, is one of the heroes. However, the opera had never been called Tigrane, as some editions say. Russian composer Alexei Artamonov as well wrote an opera dedicated to Tigranes the Great. It should be noted that prominent artist Martiros Saryan was the artistic director of the performance. However, all we know about the majority of the above mentioned operas is the date of creation and the name, since their contents were either lost or preserved partially. Besides, their librettos don’t feature the real image of Tigranes the Great but for most part a distorted historical character. That’s why these operas are of no interest to modern stage directors. PAN is presenting three of operas written by outstanding composers that reached our days. Tigrane opera by Antonio Vivaldi (1678-1741) tells about the love between the King Tigranes and Cleopatra, the daughter of Mithradates Eupator of Pontus. 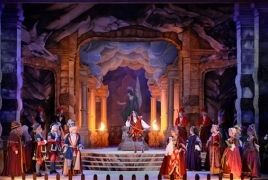 In contrary to the real historical events, the Kings in the opera are presented as enemies. Tigranes is in love with Cleopatra and to get her feelings, he joins the army of Mithradates under a fake name of Farnas and fights in battles against Mithradates’ foes, thus winning Cleopatra’s love. Meanwhile, the sister of Oronte, the Prince of Sinop, Apamia, whom King Mihrat wants to marry, falls in love with Tigranes. Oronte, in turn, wants to take Cleopatra to wife. Tigranes, true to his love for Cleopatra, rejects Apamia’s feelings. This opera had three co-authors and, fortunately, the libretto and score of the Act Two composed by Vivaldi was preserved. The Act One and Act Three were composed by Benedetto Micheli and Niccolò Rinaldi respectively. The libretto was written by Francesco Silvani. The opera was for the first time staged in Rome in 1724. Vivaldi’s Tigrane was performed in the Armenian National Theater of Opera and Ballet in 2001, concluding the events dedicated to the 1700 anniversary of Armenia’s adoption of Christianity as state religion. Alessandro Scarlatti (1660 – 1725) composed Tigrane, o vero L'egual impegno d'amore e di fede (Tigranes or The Equal Ties of Love and Faith), an opera seria in three acts with a libretto by Domenico Lalli (loosely based on the Histories of Herodotus). It was first performed at the Teatro San Bartolomeo, Naples on February 16, 1715. Queen Tomiri (Tomyris in Herodotus) has two sons. One has been kidnapped and brought up as the Armenian Prince, Tigrane. The other has been killed by Ciro, King of Persia. To avenge his death, Tomiri fights and defeats Ciro with the help of Policare and Doraspe. In return for their assistance, she promises to marry one of them, but she is reluctant to come to a decision as she finds herself attracted to Tigrane, a commander in the allied army, unaware he is her son. Ciro's daughter, Meroe, is also in love with Tigrane and arrives at Tomiri's court in disguise, bent on avenging her father. Tomiri entrusts the choice of her husband to Tigrane, who says that whichever of the two kings can beat him in combat will win Tomiri's hand. Policare and Doraspe plot against Tigrane, however, Tomiri reconciles them. Meroe is about to kill Tomiri as she sleeps when she is prevented by Tigrane. Caught with Meroe's dagger in his hand, Tigrane is accused of trying to murder Tomiri. Unwilling to reveal the truth, which would endanger Meroe, Tigrane is sentenced to death. As he faces execution, Meroe reveals her identity. She is led away in chains and Tigrane is freed. The truth about Tigrane's parents is finally discovered and Tomiri is reunited with her son. She pardons Meroe and allows her to marry Tigrane while the queen herself chooses Policare as her husband. According to music critics, this opera represents Tigranes as a personality possessing the best Armenian traits. One of the best operas dedicated to Tigranes the Great was written by Christoph Willibald Gluck (1714–1787), a prominent composer of the Classical music era and the author of 107 operas. The one dedicated to the Armenian king was written during the Italian period of his creation, when he matures in the opera-seria genre and composes his fourth opera: Tigrane. Italian playwright and librettist Carlo Goldoni contributed Gluck in his work, referring to Francesco Silvani’s The Virtue is above Love and Hate (La virtù trionfante dell'amore e dell'odio, ovvero il Tigrane) play. Inspired by the works of famous historians, specifically Plutarch’s Parallel Lives, Silvani wrote the play in 1691 that further served as the basis for a number of opera librettos. Unfortunately, Gluck’s Tigrane opera as well as many of his works created at that time were preserved only partially. Some of them were burnt in 1776, when the fire destroyed the Milan grand opera house, the others were lost during the war, when Napoleon’s soldiers looted the estate in Kahlenberg, where Gluck’s works were kept. The rest disappeared after become part of private collections. Kim Kardashian recommends Armenian cuisine in Vogue interview Kardashian West has shared her love for Armenian food with Vogue during her and husband Kanye West’s 73 questions interview.